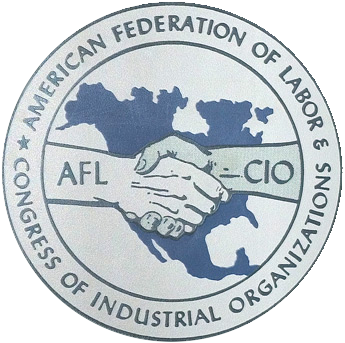 The American Federation of Labor-Congress of Industrial Organizations (AFL-CIO) is the largest federation of labor unions in the United States. Formed in 1955 in a merger between the American Federation of Labor and the Congress of Industrial Organizations, the AFL-CIO boasts membership of over 9 million voting members and 3 million associate members. While the AFL-CIO retains a large member base, the proportion of the workforce that is organized by labor unions has declined substantially since the 1960s. While the union federation has generally supported Democrats and liberal candidates, it was once far more centrist than it has been in recent years. Under former presidents George Meany and Lane Kirkland, the AFL-CIO was staunchly anti-Communist, going so far as to refuse to endorse Democratic presidential candidate Sen. George McGovern in 1972 over McGovern’s opposition to the Vietnam War. Under Kirkland’s successor John Sweeney and controversial current president Richard Trumka, the union has aligned much more closely with the Democratic Party and the organizational left. After Sweeney took over as the union’s president with Trumka as his chief lieutenant, the AFL-CIO increased its support for liberal politicians and progressive causes, including those unrelated to the economy and collective bargaining. This trend has only accelerated in recent years under Richard Trumka’s leadership. In the AFL-CIO’s 2016 fiscal year, the union reported $45,972,521 in political activities and lobbying (including $8,165,576 in deposits of employee-elected contributions to the union’s political action committee). Recipients of AFL-CIO dues-funded contributions include the Center for American Progress (CAP) Action Fund, the Economic Policy Institute (EPI), and the New World Foundation. The federation has also proposed admitting progressive groups other than unions, including the NAACP, the Sierra Club, and MomsRising, to its membership as either formal partners or affiliates. The American Federation of Labor (AFL) was founded in 1886 as a split by craft-based unions from the Knights of Labor, one of the first major labor unions to operate in the United States. Led by Samuel Gompers, the AFL focused not on political and social issues like the Knights, but rather on winning the privilege of collective bargaining for AFL member unions. Gompers’s AFL was aligned with populist Democrats like William Jennings Bryan and early progressives like Woodrow Wilson. The Congress of Industrial Organizations (CIO) split from the AFL in November 1935, shortly after the passage of the National Labor Relations Act (NLRA), which set the first federal rules for collective bargaining in American workplaces. The CIO proposed organizing based on workplace rather than skill, and the two union federations remained separate until the 1950s. After the passage of the Taft-Hartley Act in 1947, AFL president George Meany and CIO president Walter Reuther made efforts to unite the organizations. By 1955, the AFL-CIO had formed, with Meany, the less left-wing of the two federation presidents, taking office as president of the new unified federation. Meany, under pressure from Congress, cracked down on labor racketeering by expelling the International Brotherhood of Teamsters from the federation, a suspension that would not be lifted until the 1980s. Meany and Reuther sparred until Reuther and his United Auto Workers left the AFL-CIO in 1968, only returning to the federation after Meany’s death. In 1972 under the centrist Meany and his then-lieutenant and future successor Lane Kirkland, the AFL-CIO withheld its endorsement from left-wing presidential nominee Sen. George McGovern (D-S.D. ), despite Kirkland’s appearance on the “enemies list” of McGovern’s opponent, President Richard Nixon. This was in keeping with the Meany-Kirkland-era AFL-CIO’s staunch anti-Communism, which saw Kirkland provide $6 million in AFL-CIO support to the Polish labor union Solidarity, which opposed Poland’s Communist regime. Alongside and for a period after McGovern’s defeat, the AFL-CIO participated in the Coalition for a Democratic Majority, a center-left coalition seeking to push the Democratic Party towards the center. While the AFL-CIO under Meany and Kirkland had been generally center-left, a revolt within the union’s leadership after Kirkland’s retirement led to substantial change. Kirkland retired in August 1995, appointing Thomas R. Donahue president of the AFL-CIO. He would not hold office for long, being deposed by a slate of candidates led by John Sweeney of the Service Employees International Union (SEIU) at the federation’s 1995 national convention. In stark contrast to Meany and Kirkland’s centrist liberalism, Sweeney was claimed as a member by the Democratic Socialists of America, a left-wing pressure group, while head of the SEIU. He also helped lead a coalition opposing the First Gulf War. Sweeney, however, was brought into the AFL-CIO’s highest office with the staunch support of SEIU, which is divided between public and private sector employees, and the American Federation of State, County, and Municipal Employees (AFSCME), another large public-employee union. This has supported a push to the left in the AFL-CIO’s activities that has continued under Sweeney’s successor, Richard Trumka. Union members have historically split roughly 60-40 in favor of Democrats, but the political operations that ballooned under Sweeney and Trumka are highly partisan in favor of the left. While these political changes were going on, the federation and American unions in general were continuing to lose members. Membership in labor unions as a percentage of the workforce had been steadily declining since the 1950s, and it has continued through the 2000s and 2010s. These declines, and a desire by SEIU president Andy Stern to increase political activities even more than Sweeney, led Stern and Teamsters president James P. Hoffa to create a rival union federation, Change to Win. The departure of the SEIU, Teamsters, and several other unions (some of which later rejoined the AFL-CIO) cut the AFL-CIO’s membership by over three million employees. Richard Trumka was elected AFL-CIO president after Sweeney’s retirement in 2009. Trumka, the controversial former head of the United Mine Workers of America and Secretary-Treasurer of the AFL-CIO under Sweeney, took office despite allegations that he had improperly spent $150,000 to try to defeat Teamsters president James P. Hoffa in a 1996 union officer election. Trumka invoked his Fifth Amendment rights in statements to federal regulators concerning the allegations. The AFL-CIO is a federation of member labor unions that engage in collective bargaining. The federation is funded by “per capita tax,” an indirect fee on union members levied by the federation on local member unions. Nine dollars of the monthly dues bill of a member of an AFL-CIO-affiliated union is per capita tax paid to the federation. Direct representation of employees is largely the responsibility of local labor unions. The AFL-CIO reports fewer expenditures on representational activities than political activities and lobbying on the federation’s annual report. Representational activities reported on the AFL-CIO’s annual report focus on organizing and solidarity. At least since Sweeney was elected AFL-CIO president, the AFL-CIO has been a substantial supporter of the broader left-progressive movement. The federation contributes millions in dues money—in 2016, likely exceeding $12 million—to liberal activist groups annually. Federal labor law allows labor organizations to spend dues money on political lobbying and organizing, with certain limitations. The role of the AFL-CIO in the progressive infrastructure is substantial. The union federation is reportedly a member of the Democracy Alliance, reporting $110,000 in contributions to the organization of liberal donors in the union’s 2016 fiscal year. The stated purpose of the contributions were support for “Developing Progressive Democratic Community.” Committee on States, a state-level project of the Democracy Alliance, received an additional $25,000 in that year. The list of progressive organizations receiving funds from the AFL-CIO is long and covers groups in most areas of left-wing politics. Liberal economic think tanks and mobilizing groups like Economic Policy Institute, Center for Popular Democracy, and Center for Economic and Policy Research are among the recipients of AFL-CIO support. Also receiving support are progressive groups that support union-associated special interest positions, such as the Alliance for Retired Americans (which opposes public-sector pension reform) and the Coalition for Better Trade (a protectionist lobby group). Openly left-wing media outlets receive AFL-CIO funds as well. The Center for American Progress Action Fund, which publishes the ThinkProgress family of blogs, received $25,000 from the federation in 2016. The AFL-CIO also sponsors a progressive radio show aimed at union households, America’s Work Force Radio. The union federation also sponsors a handful of groups intended to spread the progressive message to conservative-leaning constituency groups. The most notable is likely the Union Sportsmen’s Alliance, an association for union member hunters. In 2016, the group received $119,500 from the AFL-CIO. In response to declining union membership, the AFL-CIO has proposed admitting non-labor-organizations to formal partnership or affiliate status. The proposal was modified substantially after building and construction trades unions objected to the federation offering membership or membership-like status to environmentalist groups including the Sierra Club. The following 10 labor organizations signed onto the letter: United Mine Workers of America (UMWA), International Brotherhood of Electrical Workers (IBEW), Laborers International Union of North America (LiUNA! ), United Association, International Brotherhood of Boilermakers (IBB), Ironworkers (IW), Utility Workers of America (UWUA), International Union of Operating Engineers (IUOE), North America’s Building Trades Union (NABTU). Like most national labor unions, the AFL-CIO supports a network of political action committees, known as “committees on political education” (or COPE) in labor union parlance. Under federal law, direct contributions from union treasuries to political campaigns are restricted. Unions are allowed to offer their members the opportunity to contribute to a union-controlled “separate segregated fund” that channels contributions to union-supported candidates and political party committees. The AFL-CIO’s political committees are substantial supporters of Democratic Party candidates. As of mid-2016, records analyzed by the Center for Responsive Politics show that the AFL-CIO’s political committees and employees spent over $57 million on contributions since records began in 1990, good for 15th place among organizations classified. Polling indicates that in a typical election, American union households (defined as union members and those living with union members) tend to split roughly 60-40 Democratic. In early 2019, the AFL-CIO released a letter urging senators on the Senate Judiciary Committee not to confirm Neomi Rao to the D.C. Circuit Court of Appeals. The letter argued that Rao would “roll back civil and human rights and eviscerate regulations that are unpopular with business interests.” It went on to accuse Rao of being racist and anti-LGBTQ-rights. Since 2009, the controversial career union officer Richard Trumka has headed the AFL-CIO. He was previously Secretary-Treasurer of the union federation under John Sweeney after a period as president of the coal miners’ union, the United Mine Workers of America (UMWA). As president of the UMWA, Trumka gained a reputation as an aggressive and combative union boss. Controversy erupted during a 1993 strike led by Trumka’s UMWA, with reported vandalism and the shooting of mine offices. During the strike, a non-union worker was shot and killed while driving past strikers. Trumka responded to the shooting by declaring, “I’m saying if you strike a match and put your finger in, common sense tells you you’re going to burn your finger.” Trumka and the UMWA were sued by the man’s widow; the case was settled out of court. Trumka has also been accused of financial improprieties at the national AFL-CIO. In 1996, Trumka endorsed incumbent Ron Carey for the office of president of the International Brotherhood of Teamsters (IBT) against James P. Hoffa. Carey was re-elected, but Trumka was accused of directing $150,000 in AFL-CIO funds to Carey’s campaign. Trumka took the Fifth under questioning by investigators and was not charged. The AFL-CIO has two other executive officers who are paid directly by the union federation, Secretary-Treasurer Elizabeth Shuler and Executive Vice President Tefere Gebre. Both are longtime union officials. Shuler held various positions with the International Brotherhood of Electrical Workers (IBEW). The AFL-CIO is divided into six trade departments that specialize in particular industries. The Building and Construction Trades Department, Maritime Trades Department, Department for Professional Employees, Transportation Trades Department, and Union Label and Service Trades Department allow member unions of the AFL-CIO to coordinate on industry-specific policies. AFL-CIO reports having 12 “related tax-exempt organizations” on its IRS Form 990 tax return. Most are the six trade departments and the Coalition of Kaiser Permanente Unions, which provide forums for AFL-CIO member unions to coordinate industry- or employer-specific policies. The union also reports its in-house insurance company for members as a subsidiary organization. The AFL-CIO also sponsors the AFL-CIO Lawyers’ Coordinating Committee. The Committee is a membership organization of union-side employment lawyers, enabling union attorneys to pool resources and organize their own demonstrations and activism within the union movement. The remaining related organizations are Working America, the American Center for International Labor Solidarity, and the Working for America Institute. Working America is a 501(c)(5) organization used by the AFL-CIO for political organizing among workers not represented by labor unions. However, reports indicate that as few as one-fourth of the claimed membership actually pay Working America dues of $5 per year. Working America is heavily involved in the AFL-CIO’s political operations, and received $7,630,560 in AFL-CIO funds for political and lobbying activities alone in the union federation’s 2016 fiscal year. The American Center for International Labor Solidarity (also known as the Solidarity Center) is an international-focused 501(c)(5) associated with the AFL-CIO. According to tax filings, it is principally funded by government grants.The Working for America Institute is a 501(c)(3) organization that runs apprenticeship programs under contract to the U.S. Department of Labor. In 2014, the Institute received almost all of its funds from government grants. In past years, the Institute has received grants from the Energy Foundation, the Alfred P. Sloan Foundation, and the Ford Foundation. In addition to its member unions and the national headquarters, the AFL-CIO organizes state federations, regional federations, and city-level labor councils to organize its member unions on the local level. The organizations, which are generally do not qualify as labor unions that fall under the transparency rules set by the Labor-Management Reporting and Disclosure Act (LMRDA), conduct campaigns at the state, regional, and local levels to advance the union’s agenda. Despite the continued rift between the AFL-CIO and the SEIU-led Change to Win union federation, the AFL-CIO will admit Change to Win member unions to its regional and local federations. Local union-organizing supporting groups known as worker centers are also eligible for admission to local councils and state federations. As of 2017, these 56 national unions are members of the AFL-CIO.